spikeowen	 05-30-2017 10-03-2017 Success 126 5/5 85F team card, 89PS, 90PS probowl, 90S, & 91PS - Signed all, thanks Mr. Lee! austeve8	 02-21-2017 03-04-2017 Success 11 1/1 Sent one card and got it back signed. Unfortunately it was all kinds of mangled and ripped and bent. Could have been the post offices fault but looks like a dog got to it but still signed it and sent it to me anyways so still happy. 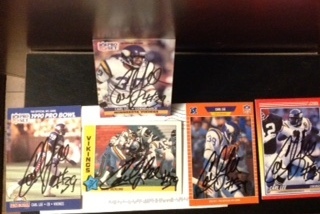 heffyscards	 12-07-2016 02-06-2017 Success 61 4/4 Signed 4 Cards, Thanks Carl! Thunderfoot	 04-27-2015 10-13-2015 Success 169 1/1 Signed 90 Pro Set, 169 days, Thanks Carl! 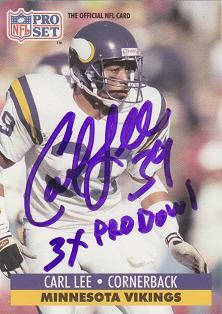 padsdsu	 11-19-2013 12-02-2013 Success 13 2/2 89 Pro Set and 90 Score both signed in purple sharpie...Go Vikings! WVSU71	 09-07-2012 09-13-2009 Success -1090 3/2 Awesome Signatrues from my former College Coach, sent a letter sent, signed cards and called me!!!! Not just a great football player but a great man. 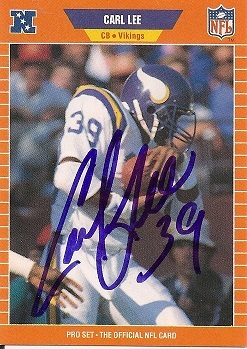 BigDaddy132	 08-15-2012 09-01-2012 Success 17 2/2 Mr. Lee signed an 89 and a 92 Pro Set.. Thanks! ddgrboy	 12-27-2011 01-24-2012 Success 28 5/5 returned 5/5. great sig!